I have spent years looking at Thoroughbred rescue sites, shopping and hoping, that one day I could take the leap and give one of these precious creatures a good home. I just wanted a friend and companion with whom I could learn and grow, and maybe even do a little bit of showing while having a lot of fun. I saw a boy on the TRF (www.trfinc.org) site who was interesting, so I contacted Kim at Montpelier Station, VA and asked if he was still available. Dance Vice, aka, Danny, has been with me for almost seven months now. I fall more and more in love with him every day. We have had dressage lessons, we are learning to jump, and we head out on the trail at least once a week. He’s been the top money raiser at a breast cancer fundraising trail ride at our barn, and is even going to “camp” to try his hand at eventing. At this point, since he’s only been under saddle off the track for about 7 months, we are just working on learning basics and seeing what we both enjoy doing the most. No one at the barn can believe he is a five year old Thoroughbred, because he is so sane and quiet and kind. Just yesterday, he came up to me from far across his field when he saw me drive up. Seeing my horse, the one I’ve dreamed about for 36 years, made me laugh and smile, because that little girl inside of me has finally gotten her horse! Presently, Danny is on Farrier’s Formula Double Strength , Probiotic and Missing Link. His coat is starting to glow (if he’d stop rolling in the mud! ), his feet are growing out the cracks that he came with, and his asymmetry that most of the OTTBs come off the track with is starting to resolve. Thanks, Smart Pak- Danny is very lucky! 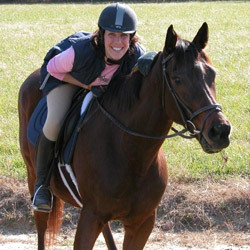 SmartPak Equine was founded by riders and horse owners for riders and horse owners. We ride and show Dressage, Hunter/Jumper, Polo, Equitation, Eventing, and Reining. We’ve logged many miles trail riding through New England’s rolling hills and the tough shrubs of Chaparral country. Our extended families include Hanoverians, Oldenburgs, Quarter Horses, Selle Français, Thoroughbreds, Lipizzans, Trakehners, Arabs, Morgans and Appaloosas. Horses, horse care and horsemanship are our passion. We got our start in 1999, with the purpose of simplifying the administration of nutritional supplements and medications to horses. Our patented SmartPak™ supplement feeding system has been adopted by thousands of barns and horse owners across the country, who value knowing that their supplements will be fed correctly. The SmartPak system has been embraced by riders from all disciplines and all levels, including many Olympic medalists. In addition to the SmartPak supplement system, we offer a broad line of horse health, show apparel, tack, dog supplies, and equine and canine pharmacy items sold through our catalogs and here on our website. Does your horse deserve to be famous? If supplements are a part of your horse care routine, you and your horse could be featured in an upcoming SmartPak catalog, guide, blog, or more! Submit your story today!